As a part of their Thanksgiving Week tradition, The Early College at Guilford Active Club hosted their third annual Turkey Bowl on Nov. 19 at the Haworth North/South Field for a school-wide competition and community-based service event. 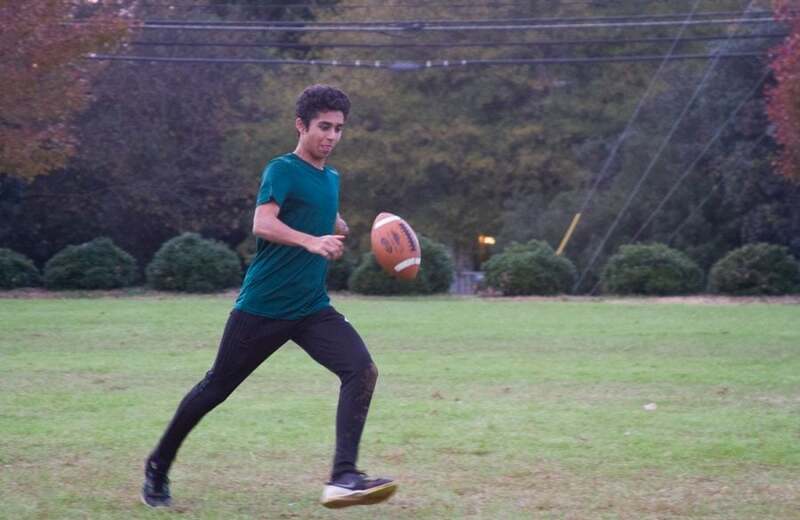 Each year, the Turkey Bowl is played tournament-style with three separate, 30-minute games coached by Early College Physical Education Teacher Zane Chamra. This year, the sophomores and juniors faced off first, followed by the freshmen and seniors. The sophomores and the seniors, victors of the first rounds, went head to head to determine the champion of 2018. Even though the other grades put up a good fight, the senior class emerged victorious, 12–0, over the sophomores in the final game of the day. The game opened up with the sophomores kicking off, yet they quickly reclaimed the ball after an interception by Trevor Craig. Even with notable catches from Sydney Partyka and Paige Abbott, the seniors managed to regain possession of the ball and prevent the sophomores from scoring. Following an incomplete in the end zone by the sophomores, the seniors determined their best shot would be short passes. The strategy worked, and by mid-game, Ryan Brown scored the first touchdown of the game. In the final five minutes, the seniors had possession, and even with the sophomores’ tight defense, Miller threw a long shot to Derek Chen in the end zone to score the final touchdown of the game. By then, the sophomores had no chance of coming back. The seniors celebrated their victory and rejoiced that they were champions in ther last year at the Early College. The other two preliminary games demonstrated similar competition and strategic gameplay. The biggest upset of the afternoon was the sophomore victory against the juniors with a score of 12–6. The sophomores took an early lead with a touchdown by Joshua Park following an interception by Craig. The juniors quickly evened up the score, however, after Robert Kobrin threw a long pass to Elliot Adamson. In the second half of the game, the juniors committed two turnovers on downs, caught one interception and had three major passes, yet they were not able to land a victory. In the subsequent game between the freshmen and the seniors, the seniors triumphed 18–0. Even though this was the freshmen’s first Turkey Bowl, they had eight caught passes during their game and were able to hold off the seniors for some time. By mid-game, however, DJ Moore intercepted the ball when guarding his sister, Lily Moore, which earned the seniors a touchdown in the next down. During the rest of the game, Elliot Rodden and Brown caught two separate long passes to each get touchdowns which secured the senior’s position in the final game between the sophomores. While the Turkey Bowl was a time to relax and compete with friends, Early College Active’s main goal for the event has always been to help others by collecting food during the holidays. The admission for the Turkey Bowl was two canned goods which were donated to A Simple Gesture, a non-profit food collection initiative in Greensboro focusing on gathering non-perishable food items to support local food banks such as Backpack Beginnings. The Early College collected cans for over two weeks in the month of November and won a competition against STEM Early College at NC A&T for collecting the most food.